Simon Staff, 37, of Lynton House, Market Rasen, pleaded guilty to stealing perfume from Savers in Lincoln when he appeared before magistrates in Lincoln. He was fined £35, ordered to pay £23.97 compensation and a £20 victim surcharge. Shannon Alice Roberts, 19, of Cliff Court, Welton, pleaded guilty to stealing toiletries from One Stop in Lincoln when she appeared at Lincoln Magistrates’ Court. She was conditionally discharged for 12-months and ordered to pay £107.57 compensation and a £20 victim surcharge. Richard Lemon, 42, of Bullington, has been fined £200 for failing to wear a seat belt. Lincoln Magistrates also ordered him to pay £85 costs and a £20 victim surcharge. Paul Anthony John Rice, 36, of Merlin Road, Brookenby, has been fined £110 in his absence by Lincoln Magistrates’ Court after being found guilty of driving without due care and attention. He was ordered to pay £85 costs and a £20 victim surcharge. Brian Burford, 67, of Sturton Road, Hatton, appeared at Lincoln Magistrates’ Court charged with speeding on a 60mph road. He pleaded guilty and the case has been adjourned until April 8 to allow magistrates to consider disqualification from driving. Tom Collins, 47, of Market Stainton, pleaded not guilty to failing to give information to a police officer relating to the identification of the identity of a driver who was alleged to have been guilty of an offence under the Road Traffic Act 1998. Lincoln Magistrates adjourned the case for trial on June 1, 2015. Scott Terry Rogers, 41, of Spring Court, Welton, pleaded guilty to possessing cannabis when he appeared at Lincoln Magistrates’ Court. He was fined £60, and ordered to pay £80 costs and a £20 victim surcharge. David Mitchell, 26, of Queen Elizabeth Street, Wragby, pleaded guilty to assaulting a man in Wragby Market Place when he appeared at Lincoln Magistrates’ Court. He was given a 12-month conditional discharge and ordered to pay £100 compensation, £85 costs, and a £15 victim surcharge. The defendants guilty plea was taken into account when passing sentence. Ashley Richard Mappin, 31, of Park View, Gallamore Lane, Market Rasen, pleaded guilty to assaulting a woman when he appeared at Lincoln Magistrates’ Court. He was sentenced to four months in prison suspended for 12 months due to the use of a weapon in the attack. He must also comply with a supervision order for 12 months and Addaction for six months. 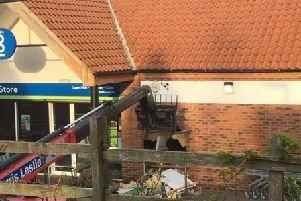 Mark Julian Little, 44, of Cabourne, was remanded on unconditional bail until May 26 after failing to appear at Lincoln Magistrates’ Court charged with dishonestly receiving stolen goods, namely a wallet, war gaming models and a caravan. He pleaded not guilty to all charges at a previous hearing. Anne Wirtz, 46, of Magna Mile, Ludford, has been fined £265 by Lincoln Magistrates’ Court after pleading guilty to speeding on the A15. Her licence was endorsed with six points and she was ordered to pay £85 costs and a £27 victim surcharge.